Due to the lack of people signing up by the deadline, this event is cancelled by Brent Baker on Wed, April 18. Mike Oglesby and Lee Cowan invite the members of the Arkansas Native Plant Society to visit Meadow Creek Vineyard in southwestern Stone County. At the confluence of Meadow Creek and the Middle Fork of the Little Red River in the Boston Mountains, the vineyard is on a terrace of Meadow Creek, overlooked by steep sandstone bluffs. Spring wildflowers abound on the terraces of Meadow Creek and the Middle Fork as well as the rich lower slopes of the adjacent mountains. Hikers may also get to visit properties of a few of Mike and Lee’s neighbors, including Meadowcreek, Inc., 1,600 acres devoted to sustainable education, recreation and wildlife preservation. This hike may vary from easy to moderately difficult depending on the interest of the group. It will also be partly “off-trail” so wear appropriate clothing and shoes. Insect repellant also is advisable. Bring a lunch and plenty of water. Please register for this trip by April 16 by contacting Arkansas Natural Heritage Commission botanist Brent Baker (trip leader) at 479.970.9143 or brent@arkansasheritage.org. Complete directions will be provided after registration. There will be a designated meeting area in a nearby town and then a caravan to Meadow Creek. This trip is dependent on the weather because streams in the area are subject to flash flooding and low-water bridges are not passable at times of high water. 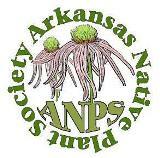 Field trips of the Arkansas Native Plant Society are for members. Botanists from around the state lead these educational walks. While on the trails, participants may ask questions, take photographs, and learn about the ecology of the area. Membership information is available here. This entry was posted in Field Trips and tagged Arkansas Native Plant Society, Little Red River (Arkansas). Bookmark the permalink.